At Latham, we focus on highly individualized treatment that supports both the student and the family. Our students range from 8 to 22 years old, and fall into two main groups who come together in this extraordinary setting. Some are girls who have coped with troubled histories, survived traumas, and multiple placements. Others are both boys and girls living with Prader-Willi Syndrome (PWS), a genetic disorder that affects every family member. What unites all of our students is what they find at Latham: a safe, healing environment, a vibrant atmosphere, and a dedicated, highly professional staff, one which offers close supervision, intensive therapy, specialized education, and vocational opportunities. Our goal is to help each student lead the most independent life possible. Students live on our Brewster campus or in a group home near campus. Our residential settings are near beaches, nature trails and bike paths. 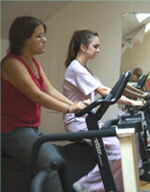 Our residential staff provides 24-hour care and supervision in a therapeutic and structured environment. Students build confidence and have many opportunities for increased independence as they learn the skills that will help them live as active participants in their communities. Our multidisciplinary professional team develops a comprehensive Individual Educational Plan (IEP) for each student. These plans are based on a thorough review of the student’s medical, social, and family history, and on assessments of the student’s medical, psychological, educational, and vocational needs. We then update each plan quarterly based on the student’s progress and changing needs. As always, we emphasize individual programs designed for each student. Our students learn in small classes, with plenty of one-on-one tutoring and counseling. Our program and facilities are geared towards helping students develop job skills, learn to work and live together, explore the world, and love all kinds of learning. Our vocational specialists act as job coaches as they help students learn job skills and find employment. Our extensive team includes doctors, nurses, clinical psychologists, social workers, physical therapists, special education teachers, computer technology instructors, and residential and vocational counselors. Our integrated services include individual and group counseling, family case work, art and recreation therapy.